We had a complete standing ovation tonight. The ENTIRE audience on their feet during the Curtain Calls and then literally dancing in the aisles for the last number! Amazing! Come and see my new production. This amazing and hilarious musical was written by Alan Menken and Howard Ashman, the writers behind many Disney classics such as Beauty and the Beast, The Little Mermaid, Aladdin and Pocahontas at the Rhoda McGaw theatre from Tuesday 16th to Saturday 20th November this year. 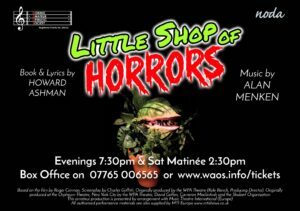 With famous songs such as “Feed Me!”, “Suddenly Seymour”, “Dentist” and “The Meek Shall Inherit”, this joyful, funny and inspiring show is full of fabulous tunes, brilliant performances and riotous dancing. Not forgetting the biggest plant you will ever see on stage! Book early to see this colourful spectacle. We are expecting full houses every night. We now have Mike Bartlett’s first set designs for our WAOS 2018 production Little Shop of Horrors. Click HERE to go to the gallery page. It’s getting REALLY exciting now!